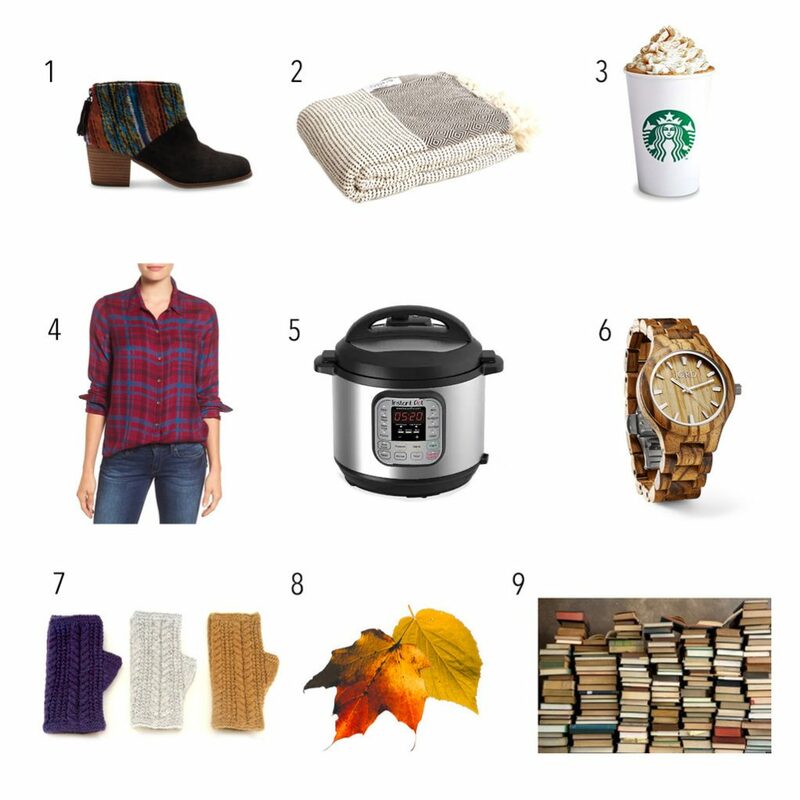 This is our last fall favorites post but we will continue fun fall inspiration up to Thanksgiving. Today Celina Baldwin is sharing her fall favs. Celina is the newest member of our creative team and she is handling our branding and admin work. She is a breath of fresh air and is a miracle worker helping us get organized and staying on top of deadlines. We already can’t live without her! Serious! 1. I actually got mine at the Toms Warehouse sale (which if it is ever in your area, you MUST go! ), but I love theses booties so much. Like all Tom’s they are super comfortable and I love the unique style! 2. I absolutely cannot recommend this blanket (and all Hygge Life blankets) enough. This is the best travel companion/daily love I have in my life. 3. Starbucks Pumpkin Spice Latte – I know it’s totally cliche, but I love the PSL. I get mine with an extra shot, does that make it better? 4. Flannel. Always and forever flannel, Flannel is my love. 5. Fall makes me want to cook and eat!! Eating Paleo (which we do often) can get boring, but the Instapot is the perfect kitchen tool for spicing and speeding up your cooking regimen. You can makes the BEST soups and stews -in under an hour! 6. I have a wood watch like this one and I cannot even tell you how much I love it! I get so many compliments and it goes with everything. I think it’s especially appropriate for fall since I’m loathing daylight savings time! 7. I hate to brag on one of my own shop’s products (just kidding- no, I don’t, I only sell stuff I think is awesome) , but I LOVE these Luxe Cable Knit Alpaca Wristwarmers. They are super soft and warm, but the best thing about them (sorry in advance) is that in the fall and winter when my eyes water and my nose runs just a little more, these are the perfect hand companion for keeping dry! Don’t worry- they are even washable. 8. Fall has always been my favorite season, it just feels new and fresh to me, I think it’s because where I grew up school started in the actual fall, not like in Colorado where school starts in the “fall” but it is mid-August! Anyway, my favorite thing is walking in the fall. The changing and falling leaves, the smell, the beauty and the color. I love everything about being outside on a crisp- not cold- fall day! 9. BOOKS! I am an avid reader. I love to read all kinds of books. I keep a running list on my blog of all the books I’ve read and give them a star rating. The list is mostly for me since I like to track how much I read (nerd alert! ), but if you are looking for a good read, I can recommend a few here. My top two of the last couple months are Big Magic by Elizabeth Gilbert and The Alchemist by Paulo Coehlo. I’ll spend the next few months cozied up inside reading all I can!